Knight Rider Historian Joe Huth is out with another great book that takes a look at the original series of Knight Rider from a fresh perspective. In Knight Rider: 30 Years of a Lone Crusader and His Talking Car, Joe Huth and co-author David Bronstein performed over 60 brand new interviews with the cast and crew, giving an insiders look at the behind the scenes of the popular 80s show over the course of 520 pages! What made you decide to write a new book? It had been 10 years since I wrote my first book, and in that time, I had learned so much about the series that I felt it was time to share a little bit of that knowledge. I felt like I needed to share this information with the general Knight Rider community, otherwise, the stories will one day just be lost forever. How did you meet your writing partner? What was the process of collaboration like and how was that different from earlier books? My writing partner, David Bronstein, emailed me in January of 2011 to ask if I'd be interested in writing a new Knight Rider book with him. He had already interviewed a few cast and crew members before even contacting me, so I was impressed with his ability to snag these interviews. The collaboration process for this book was completely different than Knight Rider Legacy. David was very friendly, professional and open to different ideas. We both seemed to be on the same wavelength in terms of how we wanted the final product to come out. In short, it was a terrific experience! Was there one thing you didn't think you'd be able to do for the book that wound up happening? I was a bit surprised at some of the people we were able to interview. We spoke with Lance Burton - one of the best magicians out there today. He has performed some 15,000 shows in Vegas, and he takes the time to talk to us about his role as Templeton in "Deadly Knightshade"! We also tracked down the man responsible for making the license plates on the series - the license plates! Who ever thought that we would find the person responsible for this small but important part of K.I.T.T.! Best story in the book that people should turn to first? Personally, I really enjoyed Mario Marcelino's interview. He played Julio in "Race for Life". He shared a very touching, real-life story that happened while on set. This episode, as many recall, has a special dedication at the end, and Mario provides the story behind it. He was also gracious enough to provide a handful of personal photos taken on set. One person you wish you had in the book but isn't? Well, of course I have to say David Hasselhoff. Getting him for either book has been just barely out of reach. For the first book, we got to his secretary, but David was out of the country and we had a deadline to reach. For this book, we talked to so many people who were still very close to David, such as Allen Payne (Knight Rider hairstylist) and Alex Daniels ("A Good Day at White Rock") and it looked like we may finally get him, but in the end, no luck. Which is your favorite book of yours? That's a tough one. The first book is special to me because it was the first. However, I had a better all around experience with the second one. So, we'll call it a draw. Is this your last book? This will most likely be my last book on the history of the series itself. I would eventually like to put together some kind of e-book of all the filming locations...like a traveler's guide to the locations used in the series. It's tougher these days to find the time. When I wrote Legacy, I was 21 and in college. I'm now 31, with a full-time job, a wife and a 2 year old son. It's a bit harder these days! Do you think Knight Rider will ever come back? I really, really hope so. It's such a unique property. How many other shows of that era have they tried repeatedly to bring back? Knight Rider 2000, Knight Rider 2010, Team Knight Rider, Knight Rider 2008.... I think it can be successfully done, they just need the right people on both sides of the camera. I could see it coming back on SyFy, or who knows, maybe that big screen version will still happen. Favorite screen used object you have? Probably my collection of dash panels that have been confirmed to have originated from the season 3/4 insert dash. I have about half of them...still on the lookout for the other half. Favorite piece of Knight Rider merchandise? I have this really cool 80's T-shirt of K.I.T.T. saying, "I'm programmed for ACTION!". It's cheesy but I love it. Favorite original Knight Rider episode? "Goliath Returns" - the perfect mix of storylines, stunts and good overcoming evil. 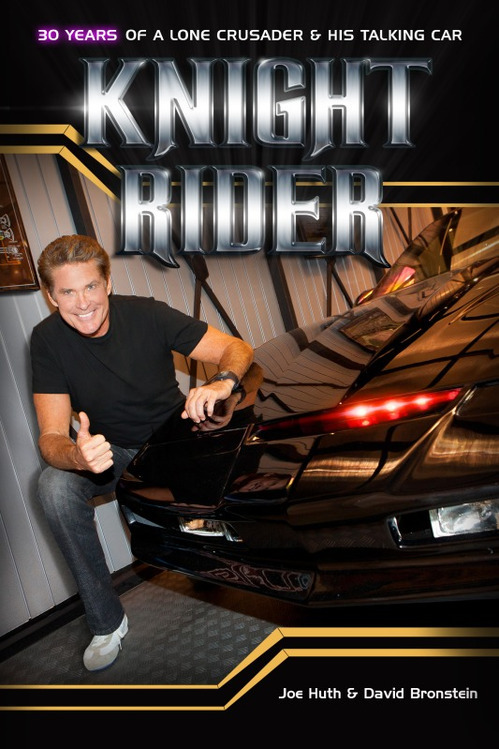 Knight Rider: 30 Years of a Lone Crusader and His Talking Car is available now from Amazon or Lulu.